The goal of Red Panda Web Design was to provide All in Web Pro clients with a lower cost option for website design services while also allowing us to add diversity to our design process. To help achieve a low-cost solution for Las Vegas Web Design clients in need of a professional web presence we turned to the SquareSpace platform and discovered its unique set of features and quick deployment options were a great fit for this web design price-point range. The Red Panda Web Design website became the homepage for this new service offering. We also wanted the site to stand out visually and because of the specific audience and our desired conversions we used a visual style that was inspired by some of our favorite 2017 design trends. The entire process for the site began out of a brainstorming session looking to find a way to provide a quality web design product to a client with a $600 – $1,200 website budget. From here we created the baseline price-points and an outline of the steps target clients would have to take. This was then expanded on and worked out into 3 different web design packages with 3 add-on services (i.e. Content Writing, Logo Design, and Business Cards) that are offered for any new website. To create a site that appeals to everyone while also showing off our design skills, a few techniques were used; such as image style treatments and the use of bright colors and gradients. All the headers of the main pages contain a hero image that was processed through photoshop to not only have an optimized file size for web but to also apply a slight purple blur to help overlaid text stand out. The buttons and menu bars feature the same Yellow to Pink to Blue gradient; using the gradient also helped created brand consistency. 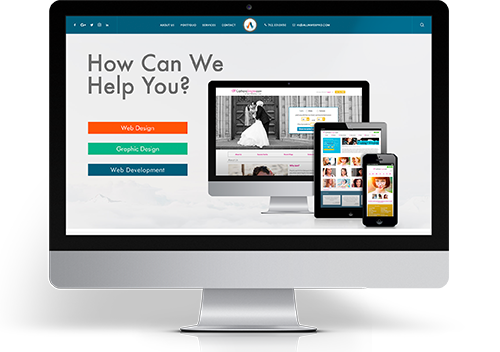 The site was built on the SquareSpace.com platform to best demonstrate some of its capabilities and design elements we can offer our clients. Overall the site came together well based on our goals and the design is something we are looking forward to getting feedback from our visitors. The site allows us a way to offer a new beneficial service to let us deliver fast and well designed websites clients on a tight budget who are looking for cheap web design services that are still professional and reliable.